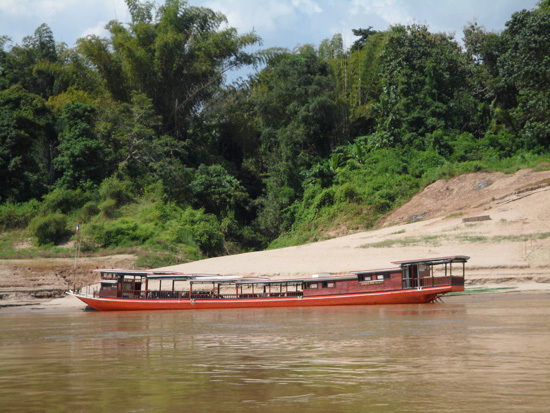 Recommended: Only if you are eager for a new experience, not as a quick and comfortable way to get to Luang Prabang. We were headed to Luang Prabang in Laos. 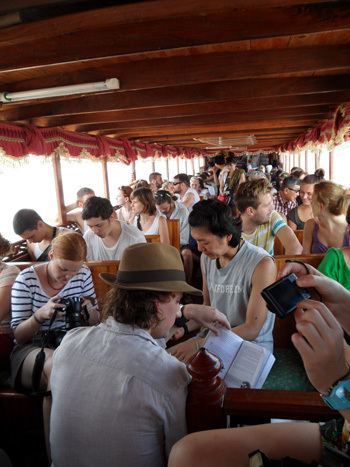 Most tour agencies in Chiang Mai offered three options to get there – by bus (18-13 hours), speed boat (2 days 1 night), or slow boat (3 days 2 nights). We had already experienced extended bus travel throughout Malaysia, most reports on the speed boat route made it sound like a suicide mission, which left the slow boat option. Way to experience not only a new country, but also a new mode of transportation. From Daret House in Chiang Mai we got tickets for 1600 Baht (about $53) each. I read of other travellers organizing this journey all by themselves, but savings of $3-6 didn’t seem worth the hassle to me. On the second day after breakfast at 7am, we were transported on the back of a pick-up truck to the Thai border check-point. The day before our guesthouse owner tried to convince us that we should pay him 100 Baht each and he would get our passports stamped so we wouldn’t have to wait in line. It all sounded rather strange and I am always wary of just handing over our passports, so we opted for waiting in line. Collecting the exit stamp took maybe 5-10 minutes of waiting in line. To cross the river to the Laos side we took a small boat (40 Baht fare included in ticket), which took not more than 2 minutes. On the Laos side/Huay Xai everyone has to line up again (no short-cuts) which kind of works as an equalizer, so I don’t see the point of paying the 100 Baht on the Thai side. To enter into Laos we had to fill out an arrival card and also a Visa on Arrival application. For me as German citizen the Visa cost $30, for Konrad as Canadian $42 (the highest! ), all other nationalities are somewhere in between. Additionally 1 passport photo was required or $1 to waive that requirement (I think they just copy the picture in the passport then). It takes about 5-10 minutes to process the visa, which is a sticker that takes one full page in your passport. All travellers that booked with tour agencies where then ushered to different shops to wait for their boat ticket and stock up on drinks and food for the day. Beer Lao and baguette sandwiches anyone? Finally, we got our boat tickets and were transported to the slow boat pier. We all were told we had reserved seats on the boat and there were actually seat numbers written on the ticket, but all that went out the window on the boat. There were no numbered seats and way more passengers than seats. We seemed to be the last group that was brought to the pier, but somehow we were lucky enough to get some of the last more comfortable car seats (part of the boat had wooden benches or plastic chairs) in the front of the boat; away from the noise and smell of the engine in the back. I am not sure how they fit everyone else on, but at around 11:30am the boat finally went on its way. Looking around I realized that almost all passengers were Western tourists, most of them backpackers. 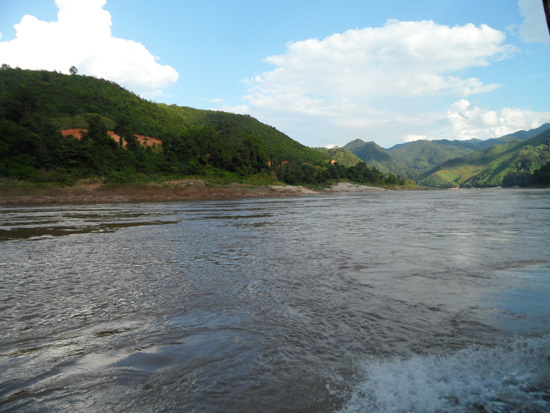 It is an interesting journey along the mighty Mekong River, quite scenic with many nice photo ops. It also gives small insights into the importance of the river for the local population. But even our nicer seats in the front got quite uncomfortable with time with no leg room to stretch out and constantly trying not to elbow your neighbour while adjusting your limbs. The arrival at Pak Beng at 5:30pm couldn’t come soon enough. Check out our report on Pak Beng and where to stay there. After a one night stay it was time for day 3 and the final leg. Again we were transported on the back of a truck to the boat pier. Most people were smarter than us and walked there instead of waiting for their transport. So the boat was filled up and all seats taken by the time we arrived. We tried making ourselves comfortable on the floor in the front of the boat together with some other late-comers. But then a few more used car seats were carried in and again we were lucky enough to get soft seats in the front. However, a number of other passengers had to sit on the floor or their backpacks. By 9:15am we were on our way. If I thought there was little leg room the day before, I was in for a surprise. Half an hour into our trip 2 more passengers were brought on board via a speed boat that caught up with us (someone sleep in?). So we scrambled a bit more and they also found some room on the floor. 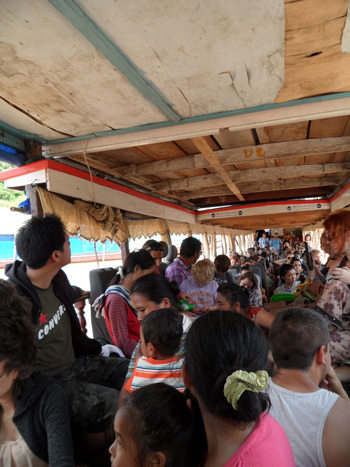 But by no means was the boat at maximum capacity yet, at least in the eyes of the operators. The boat kept stopping in several other villages by the river and every time a few more people got on. This time all locals, mainly women with little children. And every time we scrambled a bit more, gave up a little more of our leg room (you can sit cross-legged an entire day, right?) until everyone had a little square on the boat floor to plant themselves on. Suddenly I noticed something was moving and crawling in the bag of the woman sitting right next to me. 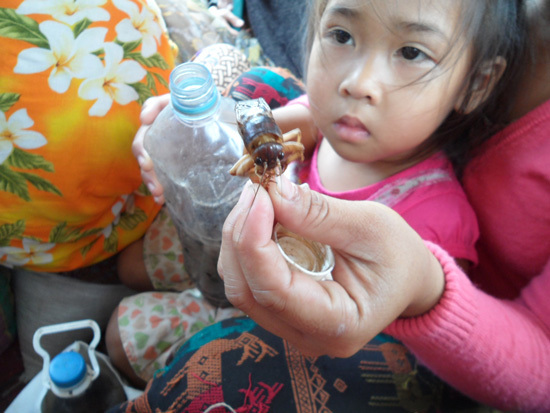 For some reason she had a water bottle full of gigantic live crickets. When she saw that it got my attention, she even took one out of the bottle. At first I was quite freaked out, but overcame it quickly. I asked her, if they were for eating and she nodded her head. No one was eating them while on the boat, so I assume they would be roasted later on. It made for some interesting photo ops seeing the little children play with crickets about the size of their hands. In the West people have iPads and iPods and other gadgets to keep children occupied during long travels, here just an enormous insect will do. 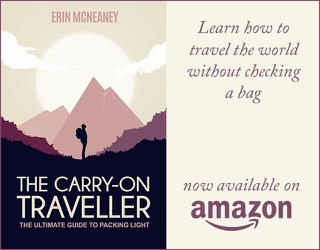 Would we recommend it? For the adventure, yes. If you don’t care for the adventure and just want to get from point A to point B, there has got to be a more comfortable way to go. Wow! Rough, but exactly what Asia is about. I wouldn’t miss the experience either!